﻿ Who doesn’t love a good tree house? As a child, my dad was nice enough to build me a three-story construct on my favorite tree in the backyard. As I study architecture and design I’ve come to realize how advanced the tree house really is. As a child I was entranced by the slide, fire pole, and rope that separated my abode from the ground, but as I study architecture and design other things about tree houses have come to strike my fancy. We have countless conversations about incorporating nature in to our designs and also about creating green and sustainable designs. What could be better than instead of chopping the trees that give us oxygen and life, incorporating them in our constructs. I love this particular tree house because of the intricacy involved. It isn’t limited to the usual one tree, or one floor for that matter. Terms for the Altermall competition dictate that the location can be determined on an individual basis. 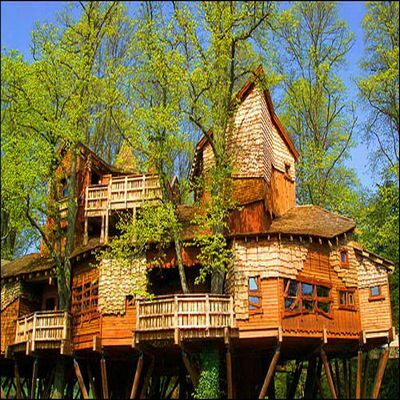 I think the tree house examples suggest deciding a location that could be not necessarily altered, but enhanced. We are asked to create an “indoor space” but with these kinds of designs, the boundaries between “indoor” and “outdoor” can be blurred.